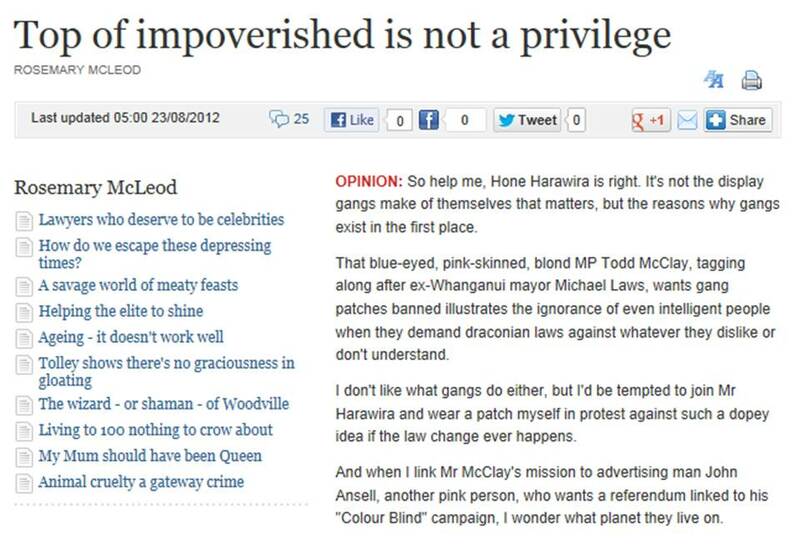 In today’s Dominion Post, Rosemary McLeod confuses privilege with failure to make the most of a privilege. Just because Ngati Tama (the Taranaki tribe that found fame unleashing genocide on the Moriori) squandered its $20 million Treaty settlement, doesn’t mean it wasn’t lucky to get it. Just because Maori remain at the bottom of all the social statistics, doesn’t mean they haven’t benefited disproportionately from the state’s largesse. What it does mean is that all ‘compensation’, all those welfare payments, all those race-based programmes they keep demanding, don’t appear to be working. That’s because so much Maori poverty is cultural and moral poverty. Clearly that culture and those morals need to change. In the past, Rosemary, like most of my opponents, has also confused racism with criticism. They’re very different things. 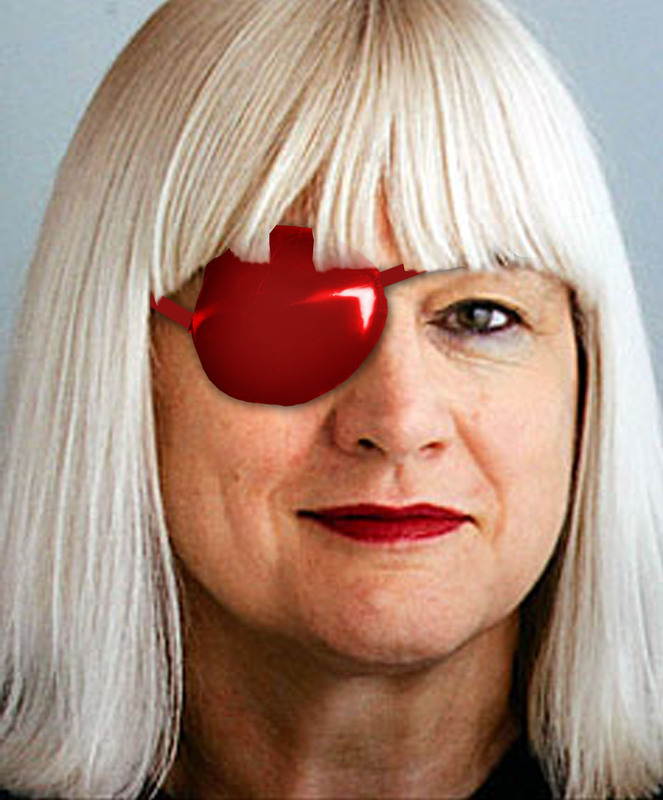 Rosemary: get your high-fashion Welly liberal eye patch off and look at both sides of the story. Like you said, Rosemary McLeod has absolutely no idea what she’s talking about. Money will never fix the negative statistics but hard work, aspiration and education will. She has probably grown up with the idea that these problems are the fault of everyone apart from the ones who aren’t making it. She needs to read more widely and think beyond the square. Me thinks the lady McLeod a rather shallow thinker. Confusing opportunity with not making the most of opportunity is very common. Especially with the loads-of-loot claims of part-Maori. I have heard it said that some big payout entities like (b)Lotto offer some sort of financial guidance to big bux winners, irrespective of the winner’s ethnic origins. Why? Because the statistics show that many have blown their new-found fortunes in an alarmingly short time. Maybe that sort of counselling is needed for all the taxpayer-paid-for-largesse that has been thither-to extravagantly handed out in part-Maori elite windfalls like so many lollies at a scramble? Why do the part-Maori (or Iwi elite) blow it so? I have my ideas, but they would be overly inflammatory. Suffice to say: easy come – easy go. Oh and on the gang topic – i dont get gangs so dont agree with Ms Mcleod or Mr Harawiras statement on gangs. In case someone thought to next suggest that I was in favour of gangs. @Simple Simon – my iwi is very frugal, and I get 6 monthly accountings of any monies spent. And maybe you could give me the numbers on iwi who have “blown their money”, I know of only a couple that have mismanaged funds to such a degree that they have let the iwi down. Rosemary McLeod is basically saying that gangs are Maori institutions that have to be treated with as if they were legitimate entities, not the criminal thugs that they actually are. The greatest poverty in Maoridom is not wealth, it is a poverty of ambition, of self-reliance and of that one thing that they keep blathering on about as so important – mana. Not all Maori mind – plenty are ambitious, self-reliant and have my respect due to the mana they have earned. Rosemary McLeod is a very strange mixture. On some issues – this is one of them – she holds very shallow, predictable PC views, and on others she does not. On this topic she can safely be ignored. May I recommend “The Great Divide” by Ian Wishart. Almost entirely based on eye-witness and contemporary accounts, and so not revisionist at all. One of his points being that it is clear from the evidence that Maori were not the first arrivals in NZ and so cannot claim to be “indigenous”. I can’t think of one where they haven’t, Anakereiti. Assuming by ‘indigenous’ you include Maori, despite them clearly being indigenous to the other side of the Pacific whence they came, can you honestly say you’re not massively better off than you would have been if Maori society had continued killing, enslaving and eating each other – as they were doing at world record pace before 1840? Would you even exist, given the widespread practice of killing newborn girls? Few ‘indigenous’ peoples, if any, are doing as well now as their colonisers, but they’re getting closer and doing a helluva lot better than their previous incarnations. The Zimbabweans were a lot more prosperous under the British than they are under Mugabe, no? And the Britons seem to have done OK since being colonised, not once but four times – by the Romans, the Anglo-Saxons, the Vikings, and the French! Like it or not, colonisation has often turned out to be the driver for massive improvements in life expectancy and standards of living . The colonisation process itself has ranged from brutal (South America) to relatively compassionate and benign (New Zealand). But if you want to dwell on the negatives, as Griever Maori are obsessed with doing, you can always find them. I think the greatest poverty Maori have faced for many many years is positive leadership. @simple simon – you can think of only 3? Maybe we should do a comparison of investments lost with say Finance companies? And then lets talk about “blowing money”. Well, I did have to check and see what information I had retained. Not just copy and paste from Wikipedia. Of course, finance companies are quite like Iwis loaded with tax-payer funded Treaty Settlement money, right? Who do you think is going to accept that as a fair comparison? Hone wasn’t it? Didn’t he want taxpayers to pay twice for Ngati Tama? Once for the settlement and second for blowing the money? Haven’t some Iwi invested in such finance-type entities, too? And the three I mentioned are only the ones I could recall, that were public knowledge. There may well be more. BTW, did you answer my questions in this post? To be honest we need to have our country run like South Africa was pre-Nelson Mandela and his tribal ANC lot. It would make our country a lot more productive and stop us pandering to a minority that are all but dead. dondiego thank you so much for posting that link, I really enjoyed reading that! A brilliant article, dondiego, thanks. Everyone should read it. Absolutely first class, dondiego, as the others have said. It should be read in schools and other educational institutes as well. Caroline Elkins, 2005. Britain’s Gulag: the Brutal End of Empire in Kenya. Random House, London. Mike Davis, 2001. Late Victorian Holocausts: El Nino Famines and the Making of the Third World. Verso, London. John Newsinger, 2006. The Blood Never Dried: a people’s history of the British empire. Bookmarks, London. Interesting stories and I’m sure they’re more than likely very true. They were very brutal times and when you are coming up against brutal people, you have to also be brutal to survive. However the documentation related to places other than New Zealand and we are very lucky that we have much documented evidence both good and bad about what happened during the early days of colonisation. However, the overriding impression I have gained is that the British bent over backwards to help the Maori people become civilised even though a certain section of them were determined to keep on with their brutal ways. What we are doing today is helping now-civilised brown skin people (many with mostly Anglo Saxon blood) at the expense (literally) of everyone else. This is where it is very uneven and unfair, not to mention divisive, and it’s time to start treating everyone equally. To Helen” I do not think you can have it both ways, Helen. You state “they were very brutal times etc – you have to also be brutal to survive”. Then you say that the British bent over backwards to help the Maori become civilised even though a certain section of them were determined to keep on with their brutal way. “you have to also be brutal to survive” – So in essence you are saying – its ok to be brutal, if you are colonising a society? but its not ok to be brutal if you are the one being colonised? Ahhh . . . .
Tu Quoque is a very common fallacy in which one attempts to defend oneself or another from criticism by turning the critique back against the accuser. I see that both the initial references were by the same author. This was an interesting and pertinent comment on the website. “Of course not, there are more important things in this world than events which happened decades ago, in a country that nobody knows and cares about any more, carried out by people who are dead and similarly forgotten. That aside, there does seem to remain a strong element of colonialist-bashing, so fashionable, these days. History is replete with human bloodshed. Dwelling on the past is backward-looking. Learn from it: yes – helps avoid repeating the mistake. Move on: yes – helps inspire progress and avoid the victim culture mentality. Dianne, by the 1830s the British Colonial Office was awash with wet liberals. By the time they agreed to take on New Zealand – reluctantly, as they didn’t want any more colonies – they had improved their act. Thanks to William Wilberforce they abolished slavery in the colonies in 1833. Wilberforce’s nephew, James Stephen, drafted Hobson’s instructions, taking great pains in a 4000 word letter to make sure Hobson did not obtain sovereignty over New Zealand without the chiefs’ consent. In the light of what I believe was a uniquely compassionate colonisation process, I would appreciate seeing your evidence of British atrocities against Maori in New Zealand. The best people seem to be able to come up with is Parihaka, where the death toll was precisely zero. There were certainly Maori deaths at the hands of the British in the wars of rebellion – but you tend to get that when people wage war on the state! I will be posting the headstones of some of the large number of innocent settlers – including old men, women and children – who were brutally butchered by Maori. Is there any evidence of Europeans committing similar atrocities against innocent Maori non-combatants? The nearest I’ve found is the execution of 100 rebel Maori prisoners by government forces on the East Coast. Tellingly, those executions were carried out not by British soldiers, but by Ropata, a loyal Maori wanting to exact utu against an enemy tribe. Mr Ansell – I do not think at any stage I said there was evidence of British atrocities against Maori in NZ. So in essence you are saying – its ok to be brutal, if you are colonising a society? but its not ok to be brutal if you are the one being colonised? I can see how you have taken my comments to mean something contradictory, Dianne. What I was trying to say was that if you come up against brutality (as in war etc), you have to fight back in attempting to contain it and bring it under control. I didn’t mean ‘brutal’ in the sense that you go out to be brutal for the sake of it. War is always a ‘brutal’ business and there will be casualties. Having said the above, I totally agree with Simon in that it is pointless to continually look backwards. The past should be the past and we should move on, learn from it, and try and make the present a better place. It’s so negative to continually look backwards and sours our souls. There are actually several words which I wish I could delete from our vocabulary forever as they’ve worn very thin and caused endless grief – all to no avail. Let’s make this a happy united country. It shouldn’t be too hard, with a bit of will from everyone!! Dianne, sorry, but I thought that by the words ‘its ok to be brutal, if you are colonising a society?’ you were implying that the British had been needlessly brutal (‘committed atrocities’) against the Maori. I had been talking about Maori atrocities against the British, and wrongly inflated ‘brutal’, which is a lower level of violence appropriate in wartime. If people like Rosemary McLeod knew the true history of our country I am sure they would change their minds on many matters. We are never told of the bad times that were also had by the Pakeha under colonialism. When the Treaty was signed, half New Zealand had already been sold or was under contract by the chiefs but when the Colonial Government investigated these sales, most were either substantially reduced in size or confiscated and returned to Maori. The settlers that had legally bought land and settled in Taranaki under the protection of the Colonial Government were abandoned and had to flee their farms, houses and stock, which were then destroyed by the Maori. Taranaki, which the Taranaki people had fled with Waikato in chase, was then purchased five times in total and still they are claiming it back today. Rebel Maori also slaughtered many innocent settlers, their wives and children and the troops had to be brought in to bring law and order as promised in the Tiriti o Waitangi. Most Maori claims were full and finally settled in the 1940’s but Pakeha have never been compensated for their losses. Today part-Maori have a taxpayer funded Tribunal to make claims for their alleged injustices that in many case have already been settled, but Pakeha can not lodge a claim, participate or appeal findings by the apartheid Waitangi Tribunal. Today Pakeha are still suffering the effects of colonialism through having to fund the Waitangi Tribunal and pay compensation to part-Maori for alleged injustices they played no part in. There are many instances where colonialism was just as bad for Pakeha as it was for Maori but this history is not told by today’s government paid historians, the Waitangi Tribunal or taught in our schools. Thanks for putting the other side, Ross. You are so right. The white people definitely have many grievances for whicht reparation hasn’t been asked for. If only the people of Maori descent could act in the same manner. As you say land bought and paid for by the white people was was later confiscated, sometimes with a small piece being given back but other times not. Also in Taranaki some bought and paid for the same piece of land up to five times. In my book there is definitely a cause for grievance there but the descendants of those people have just pressed on with their lives and put it behind them which in my view is what should be done. It was all too long ago.